Maxwell was not available as render engine in 3dsmax 2015 or older. Maxwell Parameters camera panel was missing from Target and Free cameras. The channels’ output formats were including HDR and BMP, which are not supported by Maxwell; it was saving the channels as EXR. Now those formats are not available. Some of the channels’ output formats were not showing in their drop-down menus in Windows 7, as they didn’t fit in the box. 3dsmax was crashing when the Object Properties dialogue was called and Maxwell was not the current render engine. The interface of the new Material Preview Options in the Material Editor, was a bit misaligned and too tight on the sides. 3dsmax 2019 was getting frozen when previewing Maxwell Bitmap in Material Editor in Slate mode and in some particular cases. MxLight target line was disappearing from viewport as soon as the Mxlight gizmo was moved out of the viewport. Some lines in MxLight Projector Gizmo were showing too big or too small depending on the units used in the scene. The radius of the MxLight, Area type, with Geom set to Sphere was not changing in the render according to the radius shown in viewport. The falloff and highlight cones of the MxLight Spot type won’t show in the viewport when the light is not selected (so the viewport is cleaner and ligther). Maxwell Render is available for purchase at CAD Software Direct. From now until August 31st 2018, we’ve got big discounts on all Next Limit products including RealFlow and Maxwell Render! Maxwell Render is 3D rendering software for architects and designers. Legendary for its quality and realism, Maxwell delivers great results via a simple setup which lets you focus on the lighting. Maxwell for SketchUp, Maxwell for Rhino, Maxwell for Maya, Maxwell for 3ds Max, Maxwell for Cinema 4D, Maxwell for ArchiCAD, Maxwell for Revit, Maxwell for formZ, Maxwell for MODO and Maxwell for Rhino Mac. RealFlow is an industry-standard, out-of-the-box fluid simulation software. Fast and easy to use, it is compatible with ALL major 3D platforms. You can use RealFlow for small to large scale simulations, ocean surfaces, body dynamics and much more. As well as a standalone renderer compatible with all major 3D platforms, RealFlow for Maya and RealFlow for Cinema 4D allow you to work directly within your modeller without breaking your workflow. 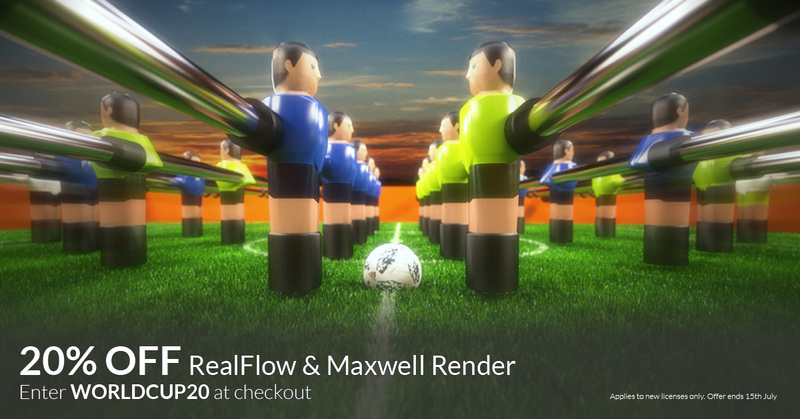 We’re already celebrating the World Cup with 20% OFF RealFlow and Maxwell Render – but it gets better. 20% OFF RealFlow and Maxwell Render now applies to new licenses AND all upgrades and crossgrades! Select the products you’d like to buy and add them to your cart at cadsoftwaredirect.com. In the checkout, simply enter promo code WORLDCUP20, and the discount will be applied straight away. To celebrate the World Cup 2018 kick-off, we’re offering 20% all new licenses for RealFlow and Maxwell Render at CAD Software Direct. Just add the products you want to buy to your cart, and enter the promo code WORLDCUP20 for instant savings! 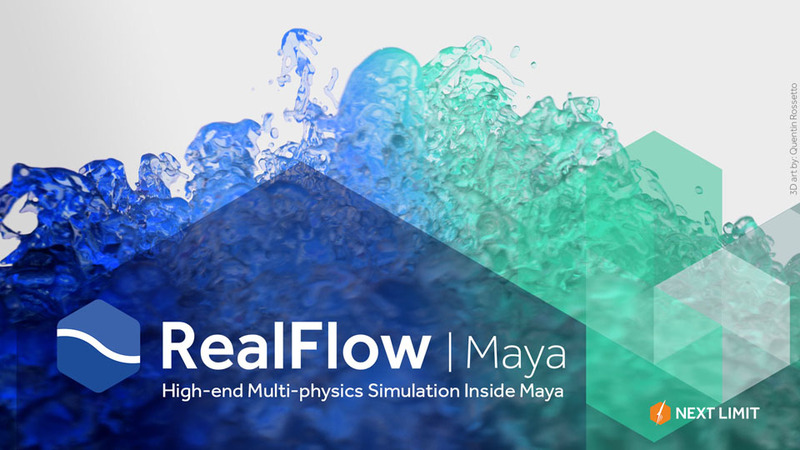 RealFlow lets you create high quality fluid sims and is compatible with all major 3D applications. Take your simulations to the next level with the astonishing quality of DYVERSO. Thanks to the powerful new DY-SPH and DY-PBD solvers and the addition of GPU acceleration, your simulations will be lightning fast. Exceed your expectations and build smooth layered meshes, making your simulations more realistic than ever. For large-scale simulations, such as floods or oceans with breaking waves, RealFlow’s cutting-edge HyFLIP solver, Hybrido2, provides you with endless possibilities. RealFlow’s grid fluid solver, also called “Hybrido” (hybrid large dimension liquid solver), is a sophisticated method of simulating medium and large-scale fluids. This technology also includes the automatic creation of secondary splash and foam particles, as well as mist. With Hybrido it is possible to simulate everything from floods to ocean scenes – scenes that are hard to create with RealFlow’s traditional particle emitters. 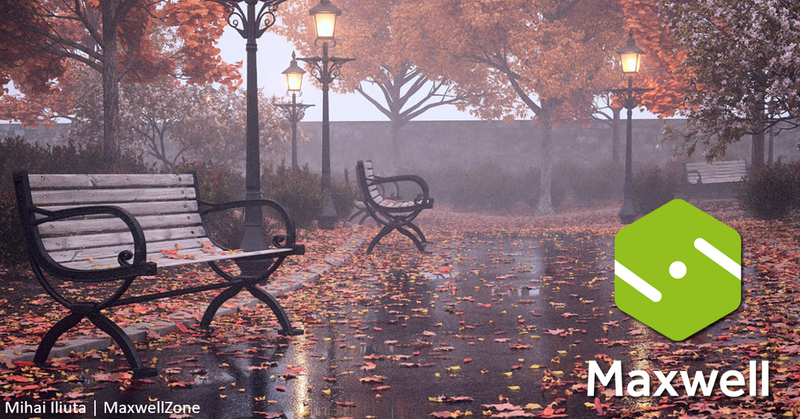 Maxwell Render is a go-to application for convincing 3D visualisation across a range of platforms. Maxwell Render is a standard in architectural visualisation and is built on an unbiased render engine that provides accurate-to-life lighting results. With fluid integrations within applications like Rhino and 3DS Max, Maxwell provides users with an effective and convincing alternative to prototyping and photography. Enter promo code WORLDCUP20 before July 15th to save on RealFlow and Maxwell render!